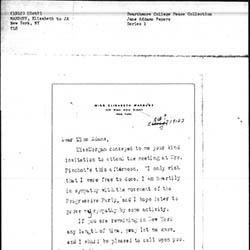 Subject is exactly "Progressive Party"
Detrich invites Addams to come to Pennsylvania to support Gifford Pinchot's political campaign. 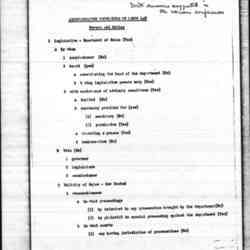 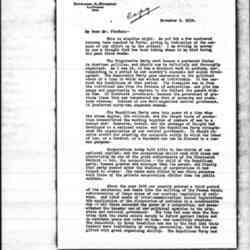 An outline for administrative provisions of labor law. 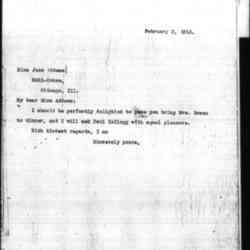 Johnson, a Socialist, writes Addams of his disappoint that she is supporting Theodore Roosevelt for President on the Progressive Party ticket. 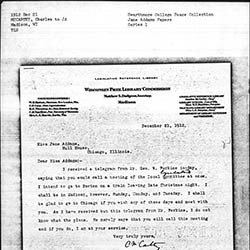 Baker returns to Addams some letters she lent him (not found) and suggests that her reputation is the strongest asset for the success of the Progressive movement. 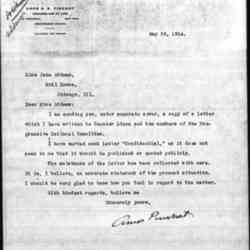 Pinchot updates Addams on Progressive Party news and forwards a letter he received from Theodore Roosevelt on trusts. 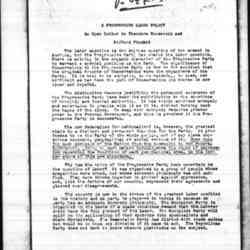 Pinchot clarifies his ideas about the Progressive Party's agenda going forward. 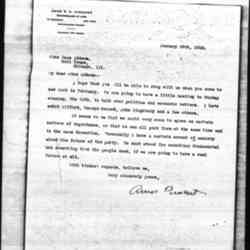 Pinchot informs Addams that Louise Bowen and Paul Kellogg are to be invited to the upcoming Progressive Party meeting in New York. 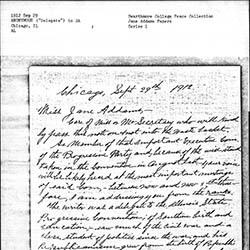 Pinchot invites Addams to a meeting in February regarding the future of the Progressive Party. 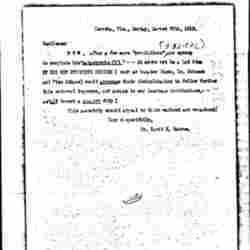 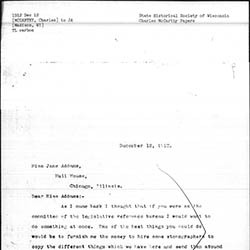 Pinchot sends Addams a confidential letter (not found) he wrote to Senator Dixon about the Progressive Party. 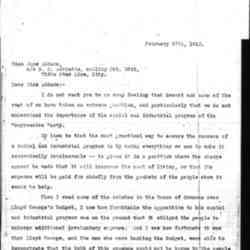 Pinchot warns Roosevelt of the danger of allowing George Perkins to have a major role in the Progressive Party, due to his ties to big business. 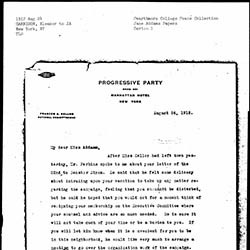 An anonymous writer gives Addams advice for the Progressive Party to win the election. 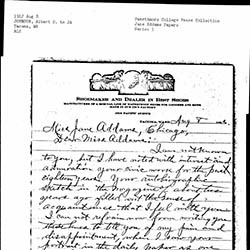 Havens, a delegate to the Progressive Convention in Chicago, praises Addams for her work and shares his great respect for her. 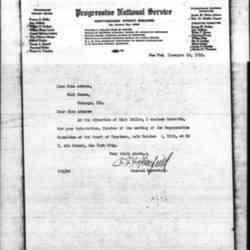 The newly formed Legislative Reference Committee of the Progressive Party seeks copies of Progressive Bills from members of the party. 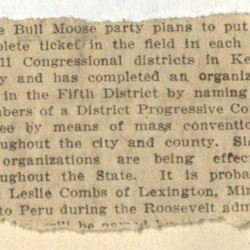 This incomplete newspaper clipping describes the Progressive Party strategy in Kentucky. 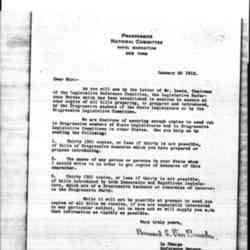 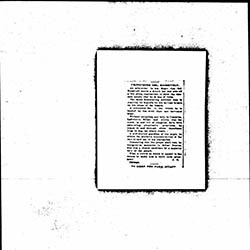 Penfield sends Addams minutes of the Progressive National Service's meeting of the Organization Committee of the Board of Trustees. 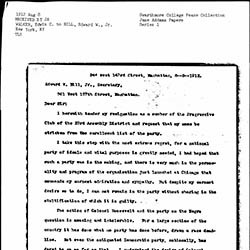 Beall encloses a letter about the Progressive Party from Edward Rumley. 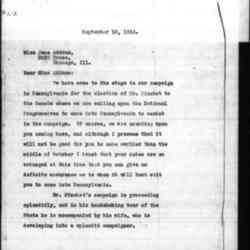 McCarthy asks Addams for financial backing for his plan to hire stenographers to help create and distribute materials and legislative bills for the Progressive Party Legislative Bureau. 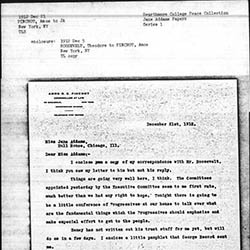 McCarthy discusses his availability for a proposed Progressive Party committee meeting in Chicago. 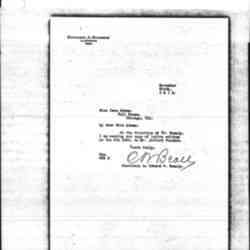 McCarthy offers his assistance in developing a legislative bureau within the Progressive Party. 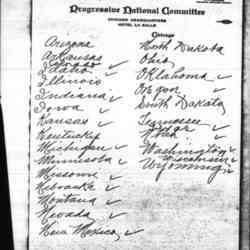 A list of states, with some checked off, written on Progressive Party stationery. 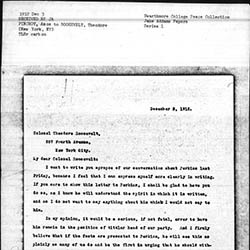 The article criticizes Theodore Roosevelt, dismissing him as a hypocrite. 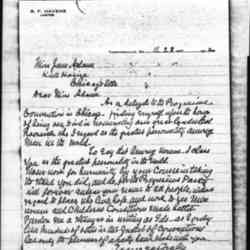 Munroe writes an unknown Theodore Roosevelt supporter and advises Senator Dixon, Addams, and Mr. Johnson to revoke their support of Roosevelt. 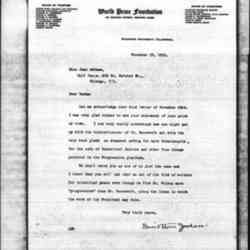 Jordan disagrees with Addams about the "progressive" qualities of Theodore Roosevelt, preferring instead the policies of Woodrow Wilson. 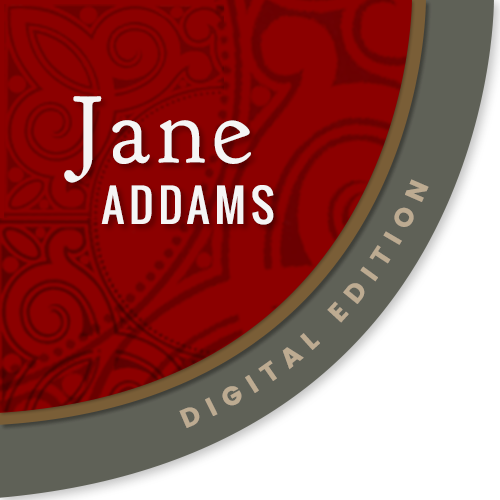 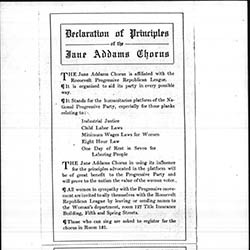 The Declaration of Principles outlines the purpose of the Jane Addams Chorus in furthering the platform of the Progressive Party. 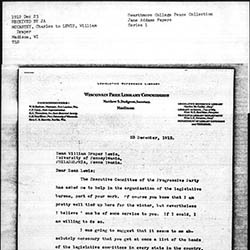 Milliken sends Addams a list of the Maine State Committee of the Progressive Party. 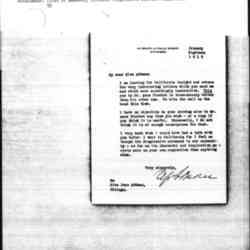 Garrison writes Addams to ensure her continued membership on the Progressive Party's Executive Committee . 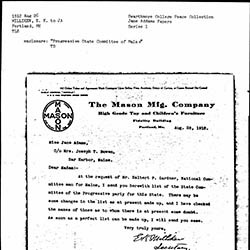 Marbury declines Addams' invitation to attend a meeting for the Progressive Party, but she hopes to show her support in the future.